I always seem to have a banana conundrum. I try to buy bunches in various stages of ripeness so they don't all turn at the same time. But lately, I find myself left with several super ripe bananas that no one wants to eat. I can't bring myself to throw them out so I've been trying to find ways to use up extra ripe nanas. 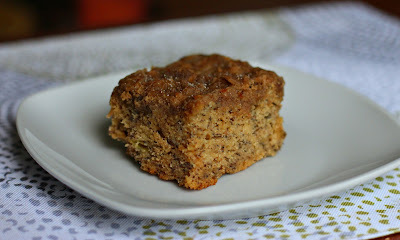 This banana coffee cake is the perfect treat with your morning or afternoon coffee. Be generous with the crumb topping! 1. Heat oven to 350. Grease an 8x8 pan. 2. In a bowl, mash the bananas, brown sugar, vanilla, and cinnamon. In another bowl, cream the butter and white sugar until light and fluffy. Add in the eggs and beat until combined. 3. To the wet ingredients, sift in the flour, baking soda, and salt. Stir until combined, then add in the sour cream and stir. 4. Pour in the mashed banana mix and stir until combined. 5. To make the crumb topping, combine the cinnamon, flour, and brown sugar. Cut in the butter until the mix looks like coarse crumbs. Honestly, I always struggle with this a bit. Sometimes it helps if the butter is a tad softened and I use my hands and a fork too. 6. Sprinkle the topping onto the batter and bake for 35-40 minutes. Allow to cool for about 10 minutes before eating.